It is an utter delight when the rain-gods decide to shower upon us after a scorching summer. Even though the ambience gets cozy and pleasant, the monsoon season is known to bring along viral infections. The humid weather coupled with a damp setting is the ideal breeding ground for seasonal viruses and bacteria. Oftentimes, babies and toddlers are most vulnerable to these infections. But, with a few handy tips, you can keep your little one infection-free while enjoying the cool showers. Bathing Routine: With germs in the air, it is important to give baby a bath or a sponge bath once a day. Always check baby’s neck, underarms, ears, private areas, and other places where baby has skin folds for any skin irritation such as rashes, cold sores or the reddening of baby’s skin. After the bath, gently wipe baby with an absorbent towel, ensuring no moisture is left on baby’s skin. Diaper Change: Avoid laundering baby's clothes in the washing machine used for A soiled diaper can make baby feel cold, uncomfortable and also breed bacteria. Change baby’s diaper regularly and make sure the diaper is disposed of properly. 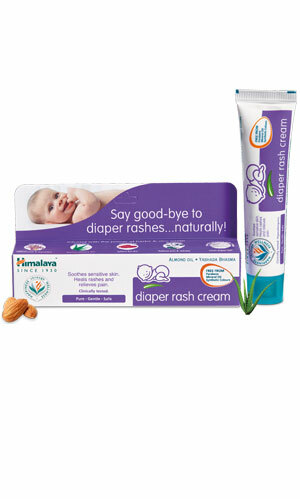 Apply a diaper rash cream to keep baby’s skin smooth and moisturized. Clothing: Dress baby in comfortable cotton clothes in sunny or humid weather. On the other hand, you may dress him in cozy, warm clothes if the climate gets chilly. Damp clothes can lead to skin infections, so do ensure that baby’s clothes are completely dry. Always wash new or stored clothes before use. Water Intake: Give boiled, cooled and filtered water to babies. Carry a bottle of water in case you are going out. If baby uses a feeding bottle, wash and sterilize the feeding bottle after each use with soap and hot water. Mosquito Net/Repellent: To ward-off mosquitoes, use a mosquito net at home or a repellent safe for baby. For natural methods, you may also grow plants like Country Mallow or Aloe Vera in your garden to keep the mosquitoes away, or spray the perimeter of your house with diluted Citronella oil. Protect Baby from the Cold and Flu: It is advisable to keep baby indoors as much as possible during the rainy season as his immunity may not be strong enough to fight the cold and flu virus. In addition, do keep baby away from anyone who is suffering from a cold or flu. Personal Hygiene and Cleanliness: Baby’s environment must be clean and dry at all times. It is also essential to keep your house clean and hygienic to keep the germs and viruses at bay. Maintain hand hygiene by washing your and baby’s hands before mealtimes and after diaper changes. In Kerala, you can find an Ayurvedic physician by taking the name of the herb Country Mallow. These physicians are experts at using the herb for women’s wellness in face packs, face scrubs, tonics and in massage oil. Known as Bala, Country Mallow is derived from the Sanskrit word meaning strength. The “strength” of Bala is used to make pregnant women’s pelvic muscles stronger for childbirth. Bala is also used for baby massage as is known to relax the nervous system, keeping babies calm. It also increases baby’s muscle strength, helps bone development and supports baby’s skin through the growth phase. Cough and Cold: Bala has strong anti-inflammatory properties that efficiently treat nasal congestion and throat irritation. Fever: Fever in children can be reduced by drinking a Bala root decoction mixed with ginger. Upset Stomach: Bala tea helps to calm stomach irritation and reduces inflammation in the gastrointestinal tract. External Wounds: The juice of the plant is used to heal external wounds. Mosquito Repellent/Bites: Studies show that a component in the plant is known to ward-off mosquitoes and also treat mosquito bites. Diaper rash is frustrating for both mother and baby. Following a simple hygiene routine can help keep baby’s bottom clean and rash free. 1. Clean the affected area with a warm, wet washcloth each time you change baby’s diaper. A washcloth cleanses the skin while being gentle. You may use baby wipes if you are away from home. 2. Air dry baby’s bottom. If you are using a towel, it is better to pat than to rub baby’s delicate skin. 3. Use a diaper rash cream to prevent rashes. Using a cream with herbal actives is ideal as it heals and protects baby’s skin. 4. Check and change baby’s diaper at regular intervals for an all smiles baby! Soiled diapers in contact with baby’s delicate skin can lead to diaper rash and an irritable baby. Peeling off a soiled diaper can sometimes reveal red, bumpy rashes. Keep this herb squad handy to rescue your baby from diaper rash. Yashada Bhasma keeps baby's skin dry and heals diaper rash. Almond Oil softens and moisturizes baby’s skin. Aloe Vera soothes and accelerates the healing of rashes. Five-Leaved Chaste Tree effectively treats sores and skin infections. You will find these super herbs in Himalaya’s Diaper Rash Cream which promote effective healing, soothe red and irritated skin, and form a protective layer on baby’s skin. Remember, rash free babies are happy babies!